Ahead of the 175th Manchester derby, Ryan Giggs reflects on two memorable United victories against City on Gary Neville's Soccerbox. First and second in the Premier League go head to head live on Nissan Super Sunday as United and City renew their age-old rivalry at Old Trafford. To build up to Sunday's clash, Reds legends Giggs and Neville have cast their minds back to November 1993, when a second-half fightback saw United claim a famous 3-2 victory at Maine Road. 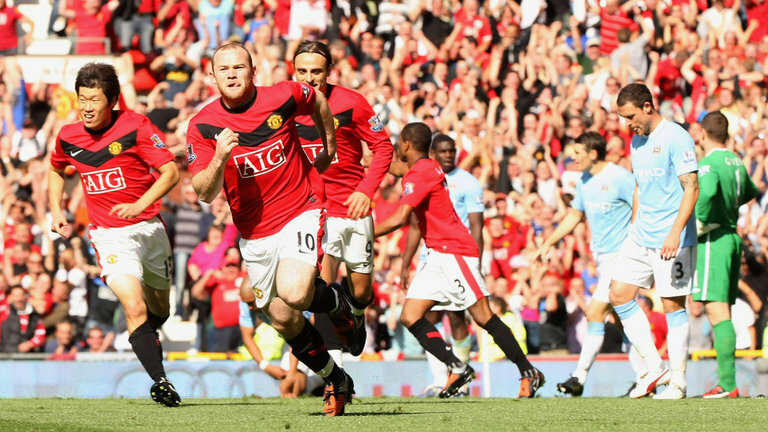 Attention then turns to United's dramatic 4-3 victory over City in September 2009, famed for Michael Owen's late winner deep into stoppage time. It's Manchester City v Manchester United in November 1993. Premier League holders United have just been knocked out of the Champions League by Galatasaray, and Ryan Giggs is placed on the bench for the trip to Maine Road. 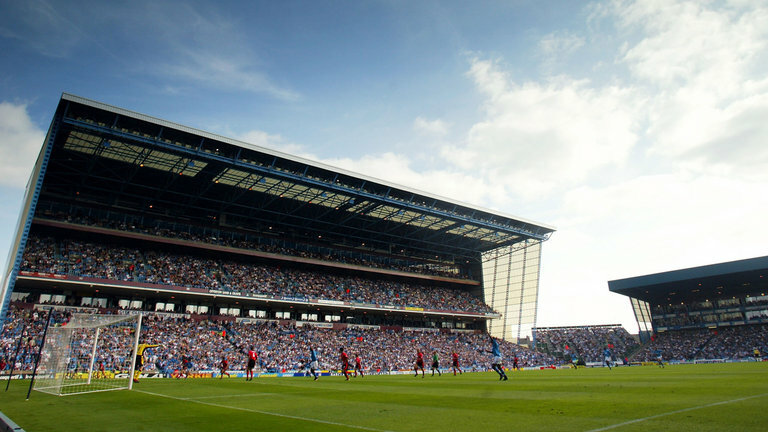 GIGGS: The ones at Maine Road were a little bit different, you never felt comfortable. It was a derby, and given we were always by far the superior team, probably unlike now, you never felt comfortable. NEVILLE: City in the early Premier League teams were… not very good. Would you agree? GIGGS: City were, compared to nowadays, just an average side. NEVILLE: He's left you on the bench, I can't imagine you were happy about that. GIGGS: I like to think I was rested, but I think the likelihood is I was dropped. NEVILLE: Did you like being a sub? Or could you adapt? GIGGS: Early on I didn't mind at all because I knew I could come on and be fresh and make things happen. It had a massive impact. This team was full of winners. Mark Hughes, Peter Schmeichel, Roy Keane, Steve Bruce. In Roy Keane, we were signing the best box-to-box midfielder. He would run beyond the forward, have a shot or get on the end of a chance, and then he would be sprinting back, tackling in front of your back four, for 90 minutes! We talk now about attacking midfielders and sitting midfielders, he could do both, no problem. 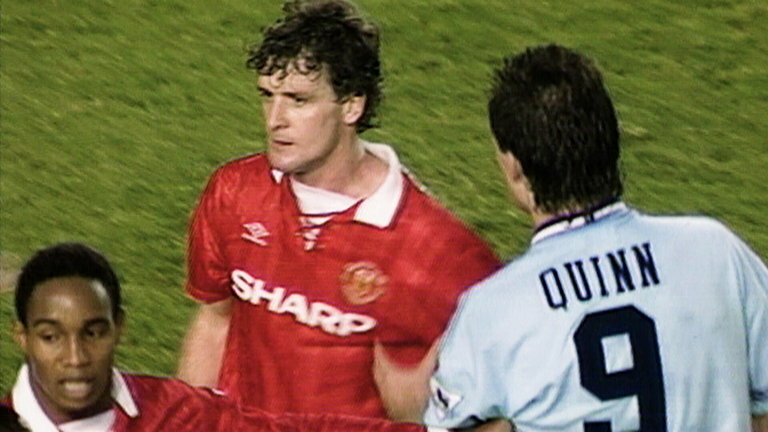 Mark Hughes goes in hard on Niall Quinn, and is then taken out by two City players before a scuffle on the pitch. GIGGS: That's what it was like. Can you imagine that nowadays? There would be yellows, sendings off. NEVILLE: He was an animal Sparky [Hughes]. An absolute animal. 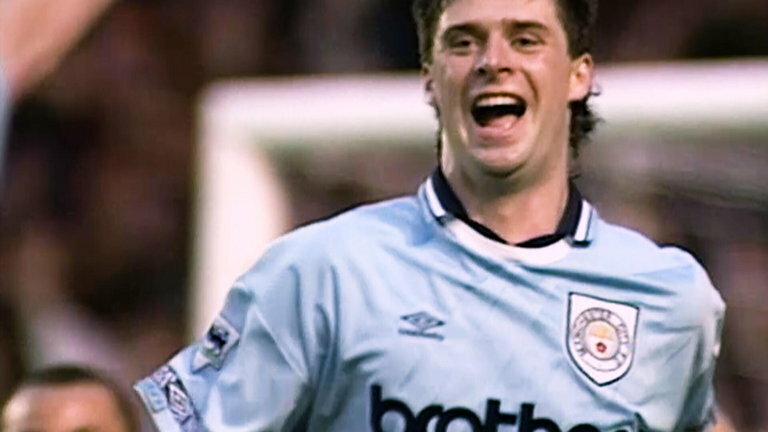 Niall Quinn gives City a first-half lead with a header, and then doubles his tally before half-time with another header. 2-0. GIGGS: We're all over the place, we need to get Giggs on! NEVILLE: Do you remember the half-time in this game? GIGGS: Well we'd obviously just gone out of Europe at our first attempt, you're down in a Manchester derby, so you're just thinking the pressure is on. Sometimes that helps because you can just go out there and play, and with the players we had, it never felt like we were out of it. You'd rather be 2-0 up, but you knew that if you kept in at 2-0 and scored that next goal, you were back in it. 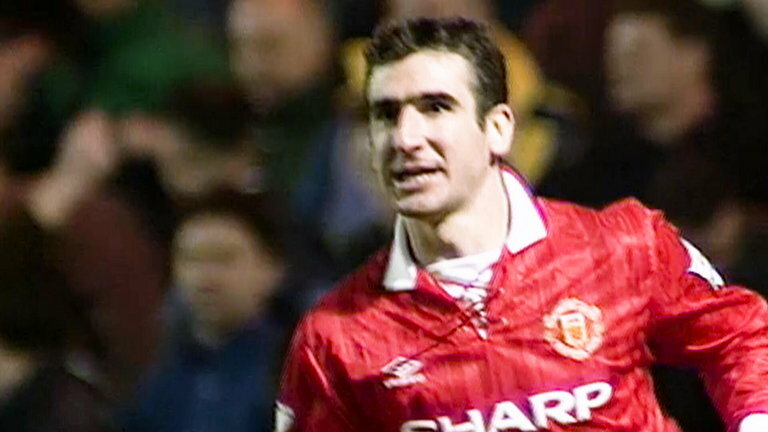 Eric Cantona pulls one back for Man Utd after half-time. 2-1. 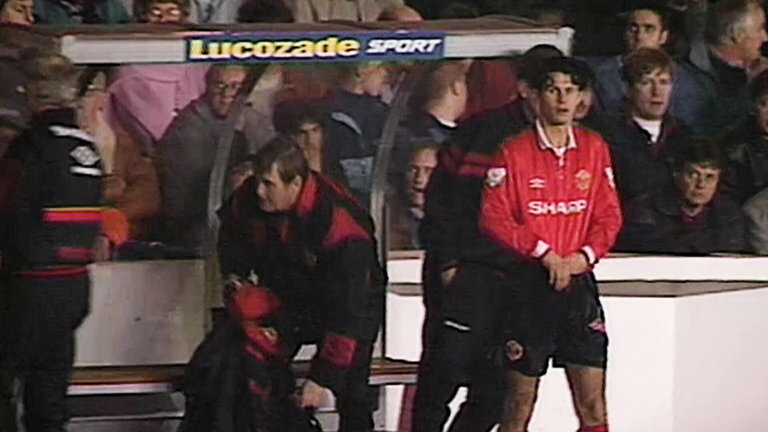 GIGGS: As soon as it goes through to Eric, you know he's not going to miss. No matter how big the stakes are, he's so cool and calm. NEVILLE: He was a mythical figure at United, but what was his influence on you at United? GIGGS: He made me play better, without a shadow of a doubt. You didn't have to communicate with him, it was just sort of telepathic for me and him. When you play, you want to give the ball to players who you are confident will know what to do, and Eric was that player. Giggs is subbed on for United with 14 minutes to go. GIGGS: I'm thinking just attack. As soon as I get the ball I'm going to attack, create something, make something happen, run at them. At that point, I wasn't too fussed about being a sub. My mindset wasn't to sulk on the bench, it was to do something when I came on. NEVILLE: Would you say they were beaten at that moment, that they were gone? GIGGS: You could sense from your own perspective that we were going to get back into this. With his first touch, Giggs play a fine ball across the face of goal for Cantona to tuck home. 2-2. GIGGS: I was just so lucky to play in a team where you could just hit an area. Very rarely when I made a goal did I pick someone up, I was just picking an area for the quality that was in there. NEVILLE: You're doing yourself a disservice there! With four minutes remaining, Roy Keane scores the winner at the far post. The turnaround is complete. 2-3. NEVILLE: Wow. One of the famous derby goals. Full-time. Manchester City 2-3 Manchester United. GIGGS: That's what our team was capable of it, never beaten, because of the characters we had in it. There's no better feeling. 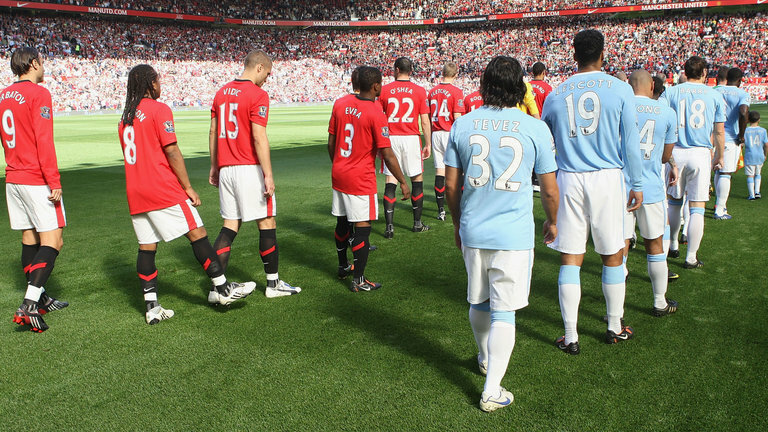 In the 153rd Manchester derby, City travelled to United on September 20, 2009. The year previously, City were taken over, and were finally competing financially with United. Carlos Tevez returned to Old Trafford for the first time following his move across the city. GIGGS: We played with Carlos, he was a brilliant player. Defending from the front, his quality, his goals. Him and Wayne Rooney up front were unbelievable. NEVILLE: What were your thoughts on him leaving? I didn't take it too well really. I always thought it was an insult, a player asking to leave Manchester United, particularly to go to a club in our country. I had a bit of sympathy if it was a Real or a Barca, but to go to our rivals, a team trying to get to where we were, I didn't take it particularly well. GIGGS: I liked Carlos. He was a good team-mate, and obviously a good player. I'm slightly different whereby I cannot understand any player leaving United. I just don't get it. So when it's your rivals - Liverpool, City - it just shouldn't happen. Especially if they're at the peak of their career and still young enough. No, it wasn't great, and I think there's a little bit that makes you try that little bit harder when you're playing against those players. NEVILLE: Every time we played City it just felt like they were getting nearer and nearer. Wayne Rooney gives United the lead. 1-0. GIGGS: I remember Sir Alex just saying you need to score more goals Wayne, because he was an all-round player. Wayne always wanted to get on the ball, drop deep, go out wide, do everything. This was the stage of his career where he more or less stayed the width of the box, and he's always been a finisher. 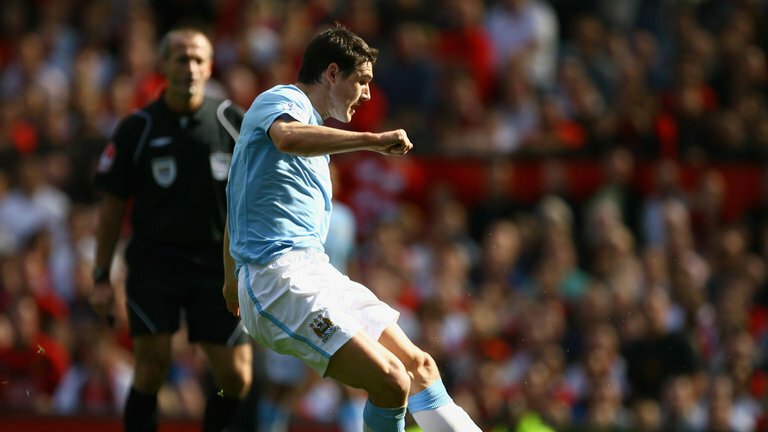 Ben Foster makes a mistake, Tevez capitalises and feeds Gareth Barry to equalise. 1-1. GIGGS: That was a bit of a killer, because at 1-0 you're looking for more, to go for the jugular. It was an open game, and Tevez hit the post shortly after. I think Patrice Evra closed him down enough. It was a weird friendship they had at United, Evra, Tevez and Ji-Sung Park! [Laughs]. Three of them would just stay around after training and play one-touch. I don't know what language they were speaking, I mean Pat can speak about 10! Darren Fletcher's second-half header from Giggs' cross gives United the lead again. 2-1. GIGGS: Shay Given was what we call a goal-line goalkeeper. He was a brilliant shot stopper but very rarely came out for crosses. So I could gamble a little bit more. If I was against Cech, or Courtois let's say, I would have to concentrate a lot more on my crosses. Actually, with Shay Given you could gamble more because you knew more often than not he wouldn't come out. Craig Bellamy scores a stunning equaliser for City. 2-2. NEVILLE: That is some strike. You played with him, tell us about him. GIGGS: He was a fantastic player. He was unstoppable, so quick, direct and had that quality at the end of it. NEVILLE: When teams score two goals at Old Trafford you know you're in a game. You know something is not quite right here. This game seemed like I was getting loads and loads of the ball. Fletcher does it again, heading home Giggs' left-wing free-kick with 10 minutes to go. 3-2. Rio Ferdinand gives the ball away in a dangerous area, and Bellamy squeezes the ball inside the near post in the 90th minute. 3-3. NEVILLE: It was a strange goal. I remember being on the bench and thinking how has that gone in? GIGGS: For me, at this point, you're thinking we're always going to get one more chance. And if it falls to you your concentration has got to be right. We always get one more chance. Deep into stoppage time, the ball drops for Giggs outside the area. He plays a pinpoint pass into the box for sub Michael Owen, who stabs it past Given. Jubilation in the stands. 4-3. GIGGS: It's a brilliant finish, he's still got loads to do. His first touch is brilliant. You get players who you don't realise just how good they are until you see them train every day. Michael at that time was no longer that rapid player who would run in-behind, scoring loads and beating players. He'd become this intelligent player who rarely lost the ball, I always noticed that. He knew his qualities, what he was good at. NEVILLE: What are you thinking when that ball was coming to you? GIGGS: It was like slow motion. I remember thinking I really had to ping it in [to Owen's feet] to beat the defenders. I always knew we'd get that one more chance, so when we did, it was about composure, calming yourself, and I didn't always have that early on in my career. With experience, it comes more often than not. You hear players say all the time, you score three, we score four. That was how we played. NEVILLE: One of the best at Old Trafford? GIGGS: One of the best atmospheres I've been involved in at Old Trafford.